Experimental Half-Hour is proud to celebrated its third year anniversary with Taped in Front of a Live Studio Audience at Mississippi Studios as part of The Projects Festival. This event was funded in part by the Regional Arts & Culture Council and Work for Art. Experimental Half-Hour is a cable television show that showcases local and international musicians, dancers, comedians, writers, and performance artists. Collaborators include established professional artists as well as new performers that excite and inspire us. In addition to broadcasting locally and maintaining a free Internet archive, EHH engages with the community by curating live multimedia performances, screening episodes at festivals, and strongly encouraging public participation at tapings. Experimental Half-Hour facilitates a connection between artists and the often underestimated resources our community provides to create, document, and share work with others. Conceptual growth is stimulated by access to a broad range of new and old technologies ranging from live video broadcasting to glitch-based homemade video effects “stomp” boxes. A video might be shot in HD, then edited on an analogue mixer. A visual artist might have the opportunity to play with a green screen for the first time or even experiment with the video medium. Eva Aguila and Brock Fansler are the Producer of Experimental Half-Hour. For the past 3 years they have dedicated their time organizing, shooting, and curating new episodes of Experimental Half-Hour. 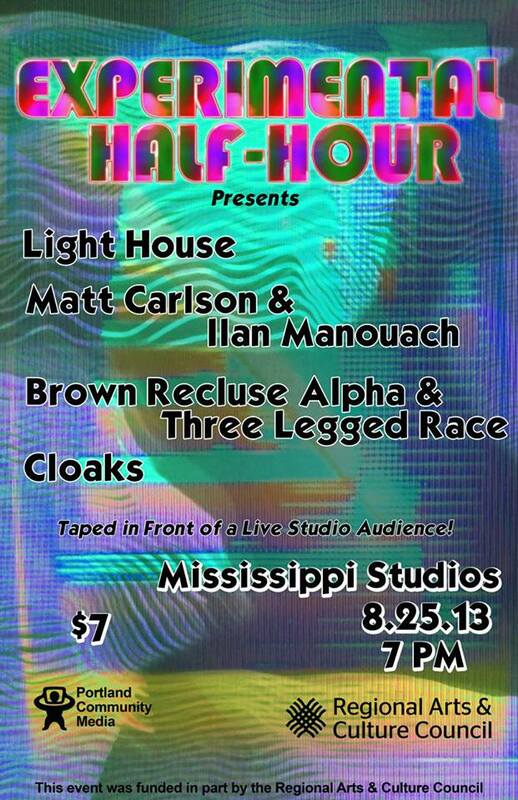 Experimental Half-Hour is proud to celebrate the third year anniversary at Mississippi Studios by hosting a night of live television, music and video manipulation. Taped in Front of a Live Studio Audience is also part of The Projects Festival happening in Portland August 22-25. Highlights of the night include live green screen recordings, special collaborations from Brown Recluse Alpha with Three Legged Race, and Matt Carlson from Golden Retriever with Ilan Manouach. Local groups Light House and Cloaks round out the night with their own performances. The night will be taped and broadcast through the facilities of Portland Community Media. This event was funded in part by the Regional Arts & Culture Council and Work for Art. The Portland duo Light House, containing ex member of The Rapture Chris Relyea and Dawn Sharp, present minimal synth in new light. Recently signed to Mannequin Records (Rome/Berlin), Light House re-release their ‘In Their Image’ EP this July (2013) to the European market. Vintage atmospherics and dreamy vocals pierce and flutter in a lulling awake of something intrinsic and heightened in us all. Matt Carlson is a composer and musician, and an active participant in Portland’s underground and experimental music scene. In his recent music, he uses his body and voice to interact with a large analog modular synthesizer, conjuring dense clouds of sound. His collaborations also include the ambient electronic jazz band Golden Retriever with bass clarinetist Jonathan Sielaff. He has released a number of solo recordings, including the well-received LPs “Particle Language” (Draft) and “All Moments” (NNA Tapes), and the cassette “Gecko Dream Levels” (Gift Tapes). He has performed at the Tate Modern in London, Barcelona’s Primavera Sound festival, Seattle’s Bumbershoot festival and in Portland’s Time-Based Art festival. Carlson studied composition and electronic music at Cornish College of the Arts in Seattle. Ilan Manouach is a visual artist, a musician and a publisher. In 1998 he moves in Belgium to study visual arts and comics. Since then he publishes instinctively and mostly in French, books, sometimes comic books, that seem unfinished and hardly form any coherent body of work. He is eager to see that happening. As a musician, his solo projects evolve from noise cut-up techniques (Balinese Beast), free impro (Wry), to elevator deep techno aesthetics (Glacial) and he also works actively within a field recordings Phd proposal project. As a publisher, he works in Athens and publishes besides translations of alternative comics, other books that matter. CF aka Brow Recluse Alpha is a Providence-based artist and musician, best known for his graphic novel serial Powr Mastrs. He has released music as Kites, Mark Lord, and Brown Recluse Alpha on labels such as Load Records. His artwork has been exhibited in New York, Paris, and Athens. Robert Beatty is a Lexington, Kentucky based artist and musician. His multi-disciplinary work in the fields of drawing, digital art, sculpture, video, graphic design, and sound often use outmoded technology to yield organic results. Beatty performs experimental electronic music as Three Legged Race and is a founding member of psychedelic noise band Hair Police. He frequently collaborates with artists and musicians as diverse as video glitch pioneer Takeshi Murata, chameleon sound manipulator/improvisor C. Spencer Yeh, text portraitist Ben Durham, and Non-Pythagorean pop composer Robert Schneider. Cloaks (sometimes modified by adjectives like “Neon” or “Visible”) is Spencer D and Ryan C. Portland locals may recognize them as permanent members and hired guns for groups like Eternal Tapestry, Operative, Miracles Club and Starving Weirdos. Their work investigates both inverted pop structures and long-form collage in a fluid mix, often with vocoded or modulated voice, digital and analog mallet work, modular synths and other abstracted sound sources. After issuing a series of full lengths in Japan and some low profile releases state-side in the once-bustling CDR underworld, they are now preparing a more widely circulated album for domestic release.